Help Ray Get His New Kidney! 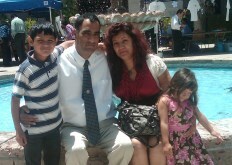 Raymond Rodriquez is in need of a kidney transplant and needs the help of his community to make it happen. Transplants are life saving, but very expensive. Nine years ago, 48-year-old Ray was diagnosed with end-stage renal disease. This turned his life upside down. He is completely dependent on dialysis, which he undergoes at home every single night. Sadly, he is unable to do many activities most would take for granted and his time spent with his wife, two sons, and daughter has been greatly limited. Ray’s only chance to return to good health is a kidney transplant. Funding this life saving procedure is a monumental task, as there will be many medical expenses not covered by insurance: co-pays, anti-rejection medications, medical procedures and hospitalization add up to more than the Rodriquez family can handle alone. To help with the financial burden of Ray’s uninsured expenses, a fundraising campaign in his honor has been established with HelpHOPELive, a trusted nonprofit organization that has been providing community-based fundraising guidance to patients and their families for more than 30 years. All donations are tax deductible, are held by HelpHOPELive in the Southwest Kidney Transplant Fund, and are administered by HelpHOPELive for transplant-related expenses only. Please, consider a contribution. Keep an eye on this campaign page because we will be planning some fundraising events soon and posting updates regularly. Thank you for your prayers and generosity. Your support is critical to the overall success of Ray’s struggle. Please know that your contribution counts. On behalf of Ray and his family, we thank you in advance for your kindness and consideration. As of Feb.10,2016 , UC San Diego Kidney transplant has made me active for transplant. awaiting that phone call. keeping the phone close by. god bless us all. further activity w/ U C San Diego. I will be activiated, soon awaiting a call from them soon. Currently on waiting list with loma linda kidney transplant. in process with uc san diego kidney transplant, they are reviewing all my medical records, awaiting approval from the commitee to be active on waiting list. have completed annual medical assessment with loma linda kidney transplant, everything is good for transplant. just waiting for the phone call, just don’t know when yet. have completed annual medical assessment with loma linda, everything looking good. just awaiting the phone call, just don’t know when. I have completed the tests at UC San Diego kidney transplant, and awaiting word to be active on the kidney transplant list to receive a kidney. we are preparing for the costs associated with this surgery. we deeply appreciate everyone’s help in making this a reality. it has been over 9 years of waiting, we are nearing the end of the journey. Once again, thank you everyone and god bless…..
My family and I have started this web page to help raise money for my kidney transplant to help cover the costs that the medical insurance will not cover. We are reaching out everyone who could help. I am starting a fundraising page to help offset the upcoming medical costs for a kidney transplant so that my family will not suffer the burden of my medical situation. I ask for your help, whatever you can give.This will help lessen the impact on my family and will also give me a little more piece of mind. My family and I appreciate your help. We thank you from bottom of our hearts. It's been a long and arduous journey but the wait is finally over! Wishing you a fast and speedy recovery! Dear Ray, Here's that Easter Miracle!! May god bless you and watch over you and your family and guide you thru your path to recovery. I will keep you all in my prayers. Raymond Know that I love you and support you. Your mother will always be with you, we are looking forward to your good health.